Yangzhou Artistic International Trading Co., Ltd.
Qingdao Jinshangxuan Commerce&trade Co., Ltd.
Ningbo Health Sports Co., Ltd.
Ningbo Elin International Trade Co., Ltd.
Qingdao Ace Plus International Trading Co., Ltd.
Rizhao Train Good International Trading Co., Ltd.
Ningbo Oceanspring Fitness Equipment Co., Ltd.
Danyang Huakang Latex Co., Ltd.
Yufeng Sports Products (Shenzhen) Co., Ltd.
Pilate&Yoga rubber resistance&stretch bands loop &bull; our 10" exercise resistance loop bands are made of natural latex and is made by dipping process. &bull; it has bright color and is seamless and will not break easily; &bull; it is dyed by non-toxic granular pigment which is mainly used to dye children's toys; &bull; we can make color-coded progressive resistance; &bull; it has no powder, no silicon. Product Display Our Advantages A portable exercise companions and can be used for exercise anywhere at any time. (Such as your logo,packing etc) 2.For exiting sample will provide for free,and with lower express shipping cost to your door directly. 3.We send you the products photos to confirm or you can arrange the third party to make the inspection,after this can do the balance payment. Moneygram,Trade assurance How to do shipping9 1.We can ship the goods by air cargo,by express,by sea freight shipping as you request. 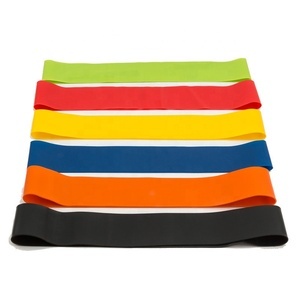 Reedow brand single resistance bands are a great alternative to conventional weights and exercise equipment. 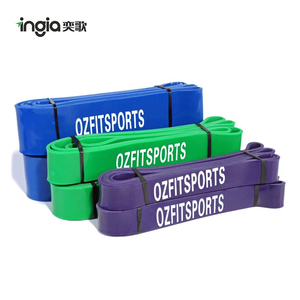 Related to 5 different loop bands stationary cord, power Band is convenient for trip fitness. Related to 5 different loop bands stationary cord, Muscle Massage roller stick is popular in European & American countries. Danyang HSM Sports Products Co., Ltd. 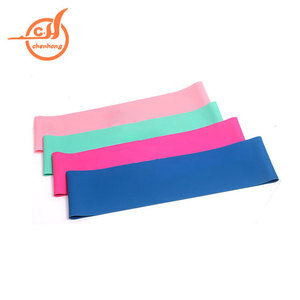 Product Name Nature latex health resistance exercise rubber loop bands MOQ 500 piece/one color Material Latex Size L 208cm W 0.64cm~10.16cm T 4.5mm Packing Each piece is wrapped with OPP film Feature Eco-friendly, Waterproof, Non-slipping, Non-toxic, Washable, Durable Color Size Weight Pounds Length Width Thickness Yellow 208cm 0.64cm 4.5mm 60g 5~15LB Green 208cm 1.3cm 4.5mm 110g 15-35LB Red 208cm 1.9cm 4.5mm 148g 25-65LB Black 208cm 2.1cm 4.5mm 165g 25-65LB Pink 208cm 2.9cm 4.5mm 178g 35-85LB Purple 208cm 3.2cm 4.5mm 242g 35-85LB Fruit Green 208cm 4.5cm 4.5mm 260g 50-125LB Blue 208cm 6.4cm 4.5mm 374g 65-175LB Orange 208cm 8.3cm 4.5mm 538g 85-230LB Gray 208cm 10.16cm 4.5mm 706g 100-250LB Detailed Images Other Color Selection: Logistics INFO &#65288;1&#65289;Shipping Cooperative logistics companies have DHL / UPS / TNT &#65288;2&#65289;Fast Delivery Different products will be required different times Company INFO Fuqing Shengde Plastic&Rubber Products Co., Ltd. Fuqing Shengde Plastic&Rubber Products Co., Ltd. was established in 1995, is a professional yoga products manufacturer, has 22 years of experience in the export trade, our products are certified by BSCI,SGS, and exported to Europe, North America and other countries. 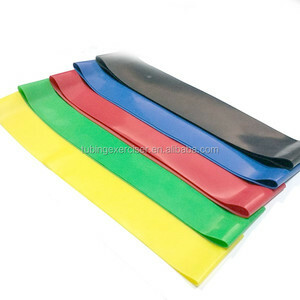 Jiangsu Kaileisi Latex Products Co., Ltd.
Zhangjiagang Kingholy Trading Co., Ltd.
Wuxi IUSummer Tech Co., Ltd.
Shenzhen Aini Sports&Leisure Products Co., Ltd.
Jiangsu Kuanki Industry & Technological Co., Ltd.
Nantong Huiqiao Trading Co., Ltd.
Alibaba.com offers 8,720 rubber band loop products. About 75% of these are other fitness & bodybuilding products, 1% are waist support, and 1% are bag parts & accessories. 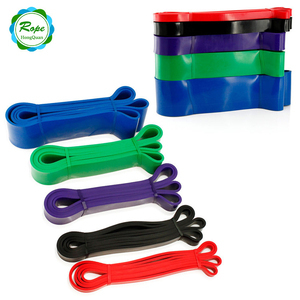 A wide variety of rubber band loop options are available to you, such as polyester / nylon, 100% nylon. You can also choose from free samples, paid samples. There are 8,794 rubber band loop suppliers, mainly located in Asia. The top supplying countries are China (Mainland), Pakistan, and Taiwan, which supply 90%, 9%, and 1% of rubber band loop respectively. Rubber band loop products are most popular in North America, Western Europe, and South America. You can ensure product safety by selecting from certified suppliers, including 1,684 with ISO9001, 468 with Other, and 227 with ISO13485 certification.